Good evening friends, glad you had time to drop by my little card spot, hope you had an enjoyable weekend, I did despite the very hot temps. Used: light green card stock a round doilie and an overlay of Gold foil cut with my nestibilities. My flowers are punched wit an EK Success flower punch secured with buttons or brads. 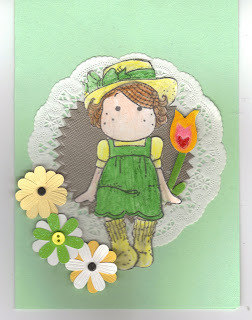 The tulip was from my stash and colored with StampinUp write Markers. Tilda image I found somewhere on the net and colored her with watercolored pencils. So pretty! Love the layout and the punched out flowers are great too! Thanks for playing with Paper Sundaes this week. Oh my gosh Judie this is just adorable! Thanks for playing at Paper Sundaes. Fantastic card Judie. I love your Tilda image and your flowers you made. hmmmmm I never think to use a doilie on my cards and it looks so nice.